A neat community trend over the last decade or so has been the creation of what many towns and cities label their “Movie in the Park” on those wonderful summer evenings. The development of the Inflatable Movie Screen has made possible any number of locations where viewers can now gather to take in a favorite movie – and all under the stars. Giant Inflatable Screens are owned by nearly every Inflatable rental company these days, just contact your local bounce rental company and see if they have an inflatable blow-up screen for rent. 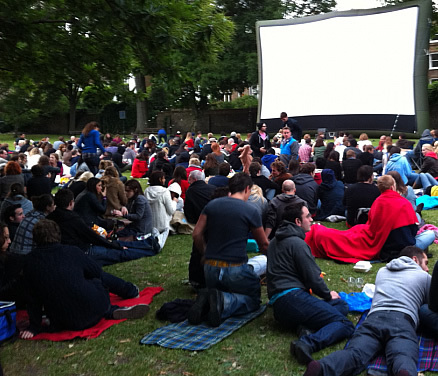 Remember the incredible popularity of movie in the park nights, as well as concerts in the park – you will want to reserve your blow-up movie screen well in advance of your event.